The Pneumatic Tube Trap is a Limited Edition Physical type weapon. A simple pressure plate below the cheese activates the powerful vacuum tube sucking the mouse to any location you or the vast network of tubes dictates. The highly lucky suction is capable of capturing a mouse that is on the brink of escape, producing a satisfying "FOOOMP" sound. 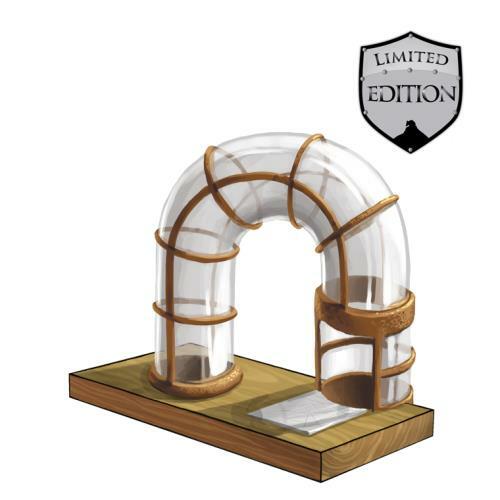 The Pneumatic Tube Trap is a Limited Edition weapon and can no longer be acquired by Hunters. It was available to be purchased for 370,000 gold from Ronza's Traveling Shoppe during Ronza's January 2011 visit. It could be refunded for 74,000 gold at the same location. 12 January 2011: The Pneumatic Tube Trap was released.